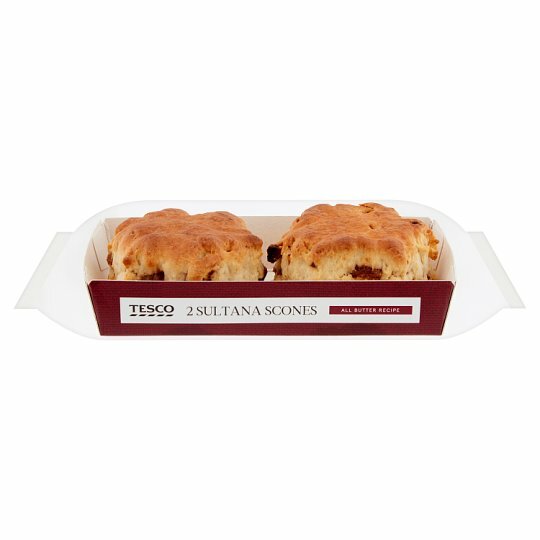 2 All butter sultana scones. INGREDIENTS: Wheat Flour (Wheat Flour, Calcium Carbonate, Iron, Niacin, Thiamin), Sultanas (17%), Butter (Milk) (13%), Water, Sugar, Dried Skimmed Milk, Raising Agents (Disodium Diphosphate, Sodium Bicarbonate), Pasteurised Egg. Defrost thoroughly for a minimum of 2 hours at room temperature.Once defrosted use on the same day and do not refreeze.